LA-3A Plug-In, Software compressor from Universal Audio in the UAD Plug-In series. Installation very simple: we'achte, it will download an small file on the AU site, you double click on it and nothing else. My computer is an old carne (250 RAM, PII ...), but not really necessary with the ferrari I Behind (SS32 an SSL / Soundscape with his card Mixpander 9). In addition this plugin only runs on the card UAD1 (and UAD2 too recently). So this plug works without any concern Manir and very stable! I use it for a month now. What I like most is the cot "round" it gives, not a plug "transparent", we feel it is ds assign a track ... n'crase not signal it (as one might imagine being able to do so with a Distressor or 1176). 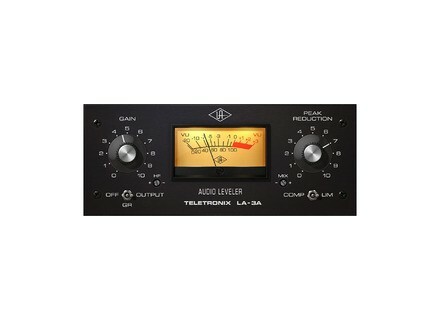 On low it's really very very nice, with Eq upstream we come cut the sound you want! He has a cot a little more massive than the Joemeek Vintage (sounding a little more reggae for example, I have a home ...). Pay $ 24 vouchers from various or 18 Euros ... And he is widely !